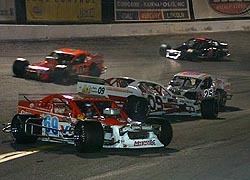 John Blewett, III is known as one of the toughest and most fierce competitors on the East Coast Modified racing scene. His aggressive nature and heavy right foot have put him in many a victory lane throughout his career. At Saturday night’s Third-Annual North-South Shootout at Concord (NC) Motorsport Park however, a different driving style won the Howell, New Jersey driver his second NSS victory in just three years. Blewett had to work his way up to the front from his 13th-place starting position while polesitter Donny Lia set the pace early in the 100-lap event. Lia, the 2004 North-South Shootout Champion, was chased early by Zach Sylvester and Todd Szegedy. The three Northerners ran nose-to-tail in the opening laps, but a caution on lap 36 slowed the field and proved to be the turning point for the early favorite Lia. 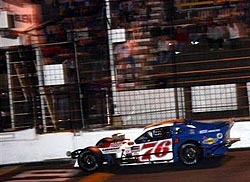 Under the yellow, Lia jumped to pit road and was followed by several cars including Todd Szegedy, who was running fourth at the time, but the pits were not yet open. On the next lap under caution, the rest of the leaders took service on an open pit road. Lia and the other drivers that pitted too early were forced to the rear of the field. Lia restarted from the 26th position and Pete Brittain, who did not stop under the caution, inherited the lead. Blewett restarted fourth and took the lead when Brittain relinquished the top spot in favor of a two-tire pit stop under yellow on lap 41. Blewett’s advantage was short lived however, as Northerner Doug Coby made the outside lane work to get around him by turn three on the restart. Sylvester followed Coby around Blewett for second, but Blewett was not discouraged about giving up the lead. After Coby and Sylvester got by him on the restart, Blewett clicked off laps behind the two as the leaders worked steadily through lapped traffic. Blewett used the slower cars to his advantage to pass Sylvester for second on lap 73 after a two-lap, side-by-side battle. Two laps after he took second, Blewett found himself getting the best of Coby to retake the lead. The yellow flag flew for the final time on lap 92 when Pete Brittain looped his once-leading car in turn three. On the ensuing single-file restart Blewett got the jump on Sylvester, Coby, and Whelen Southern Modified Tour regular Brian Loftin, who quietly worked his way into the top-five late in the race. Sylvester gave Blewett one last run on the final corner but was not able to get position. 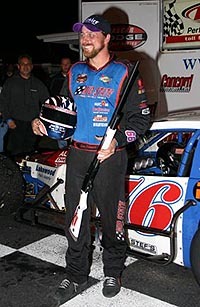 The win was an emotional one for Blewett, as health problems kept him out of the driver’s seat often in 2005. He looked to his family-operated team help him regroup and get back to the winner’s circle for the second time at the North-South Shootout. 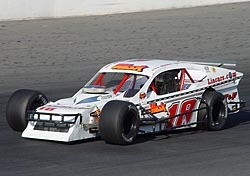 Making the win even more special to Blewett was that he could share it with his grandfather, John Blewett, Sr., a legendary New Jersey Modified driver and a motivating force in the racing careers of John, III and his brother Jimmy who finished sixth in Saturday’s 100-lapper. A wreck in turn three (top, DuPont photo) might have been what cost Donny Lia (bottom, 51 Photo) the victory. At the checkers, Blewett and Sylvester led the charge for the Northern Modified contingent, while Brian Loftin’s third place finish was the best for the Southerners. Donny Lia bounced back from his pit miscue to post a strong fourth place finish, while Doug Coby slid back to fifth over the final laps after leading in the middle portion of the event. We’ll have more coverage from Concord and the Third Annual North-South Shootout later in the week in Leftovers.